I mentioned the process of underlining in a previous post. This wasn’t part of the pattern’s directions for my gown – they merely indicate making a lining (which I did, too, and which you can see here). However, Susan Khalje explains in Bridal Couture the whys and hows of underlining a formal garment. You can see here all the bodice pieces and one of the 9 skirt panels. 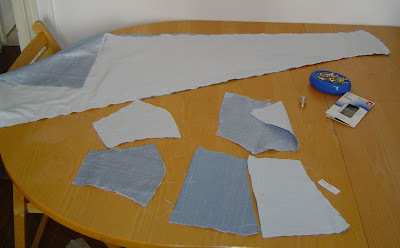 I cut each of the pattern pieces once in the dupioni, and once in lightweight batiste. The two layers then need to be hand-basted in order to prevent any shifting, and are then handled as one layer when you construct the dress. you only have to add the pattern’s markings to the underlining, which means you don’t have to worry about markings that may not be erased easily on the fashion fabric, and that may show through. The double layer limits the tension/puckering problems when sewing on the machine. I did use a tiny 60 needle, however. After a few tests on a scrap, that is what gave the best results on the dupioni. You may make a seamstress out of me yet Isabelle. Love all this sewing information you are sharing with us. Thank you. I’m reading this now with an entirely new understanding! What a gorgeous gown you made. Underlining really is wonderful. I wish I had underlined my skirt!